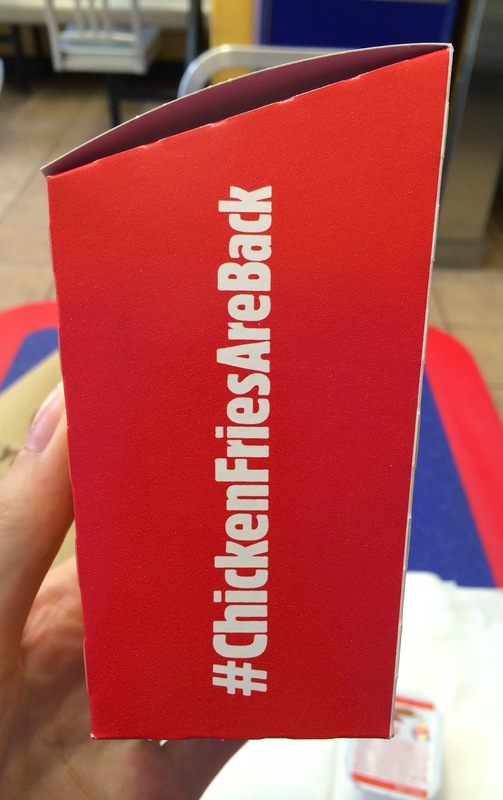 One of the Twitter account I follow tweeted about comeback of "Chicken Fries" from Burger King, and I'd never tried them before or even known about the item, so I tried some today. I researched and I found the press release. 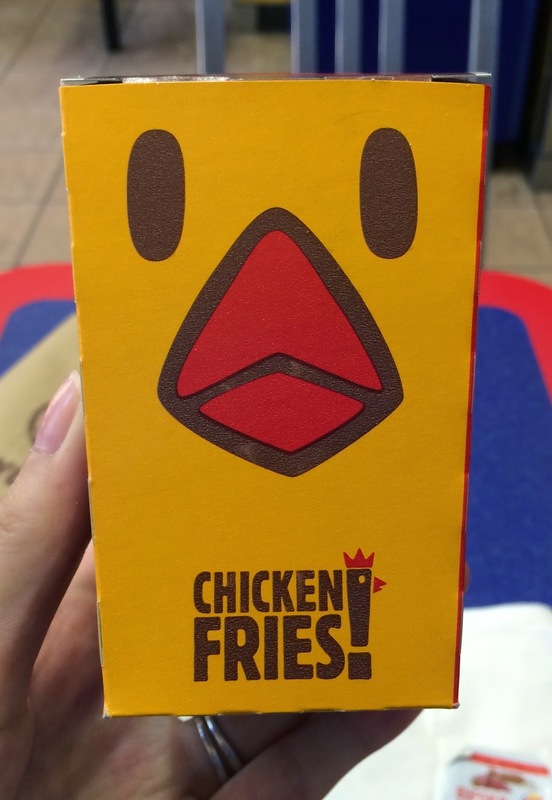 Burger King announced on August 12, 2014 that the Chicken Fries, which were originally launched in 2005, would be available again nationwide for a limited time at participating restaurants. 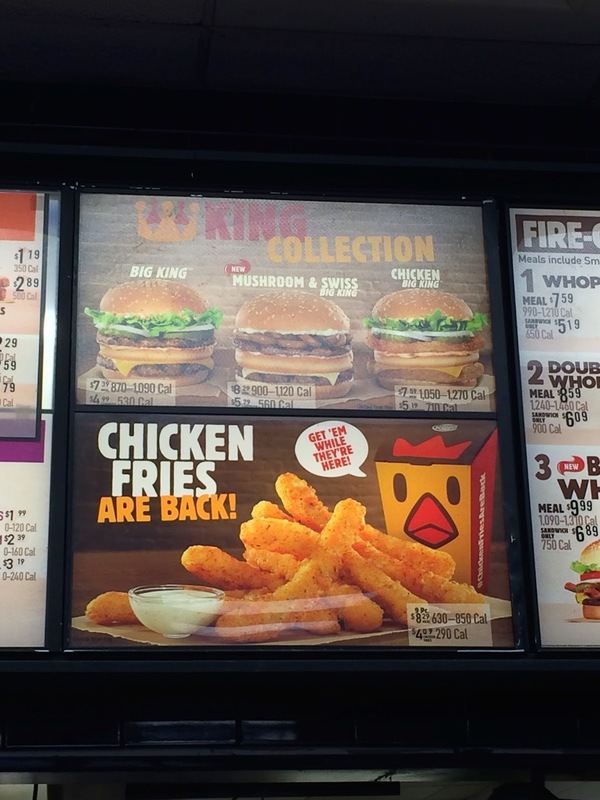 Apparently Chicken Fries were discontinued in 2012, but for those who loved the item couldn't be ignored and Burger King brought back Chicken Fries again. 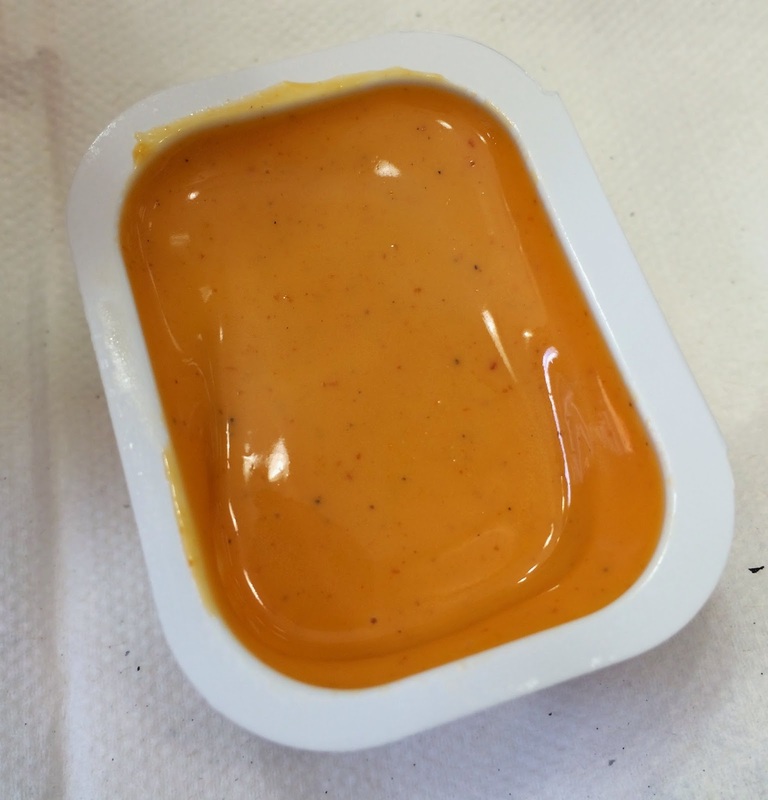 You can choose a sauce from BBQ, Honey Mustard, Ranch, Zesty, Buffalo and Sweet & Sour. It's not mentioned anything, of course, about the "Satisfries," a lower-calories, lower-fat and lower-sodium crinkle-cut fries launched on September 24, 2013 focusing on health conscious consumers. However, when it comes to fast food industries, healthy option is a tough item to sell, which is definitely true because if they're concerned about the calories, they wouldn't eat fast food to begin with. 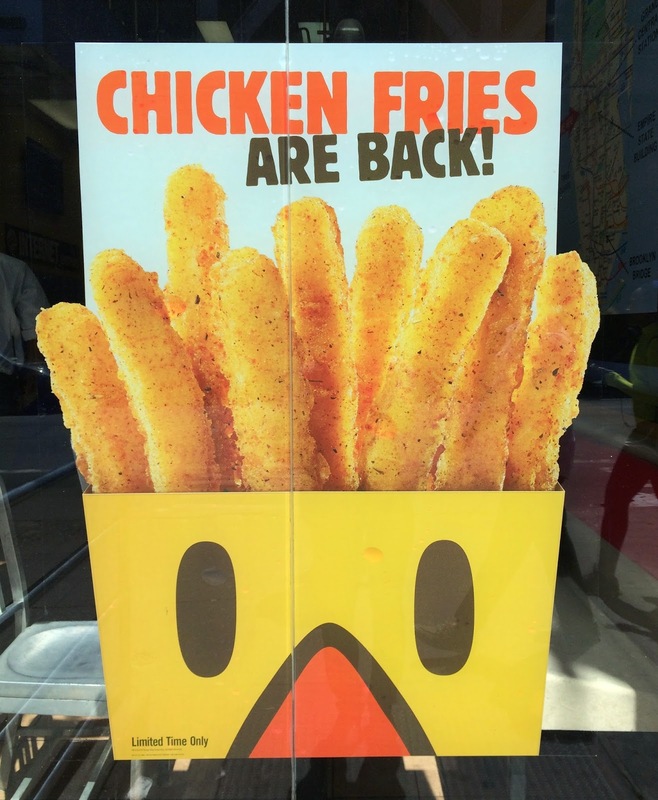 Satisfries has been off from the menu already but 2,500 restaurants will keep them on their permanent menu. 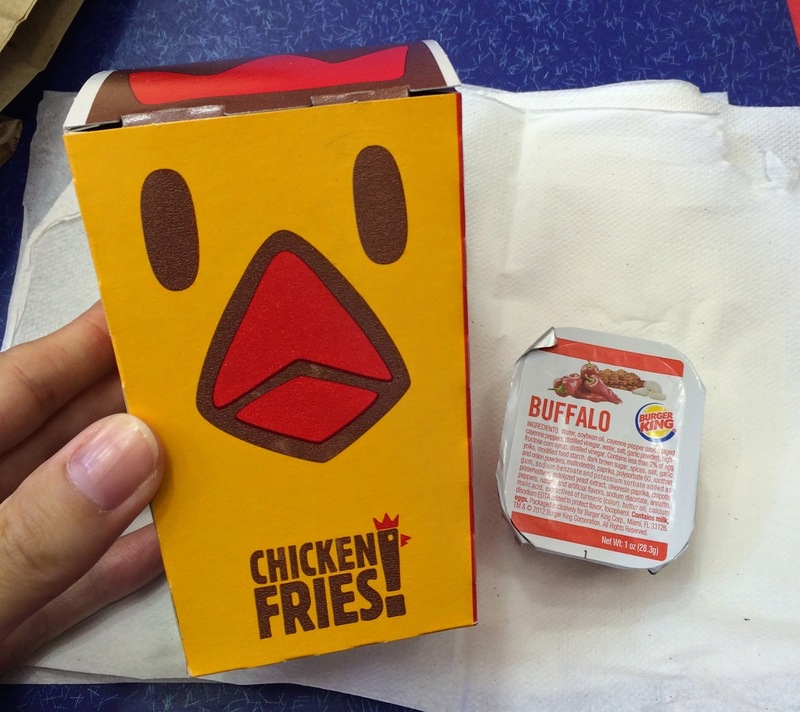 Other Burger King items I reviewed. The branch I went to was near Port Authority, and it's one of the worst fast food service like Yelp said. I ordered one Chicken Fries and the cashier said, "Sauce?" without listing up any sauce, so I asked her what kind of sauce they have and she said, "Waaa?" 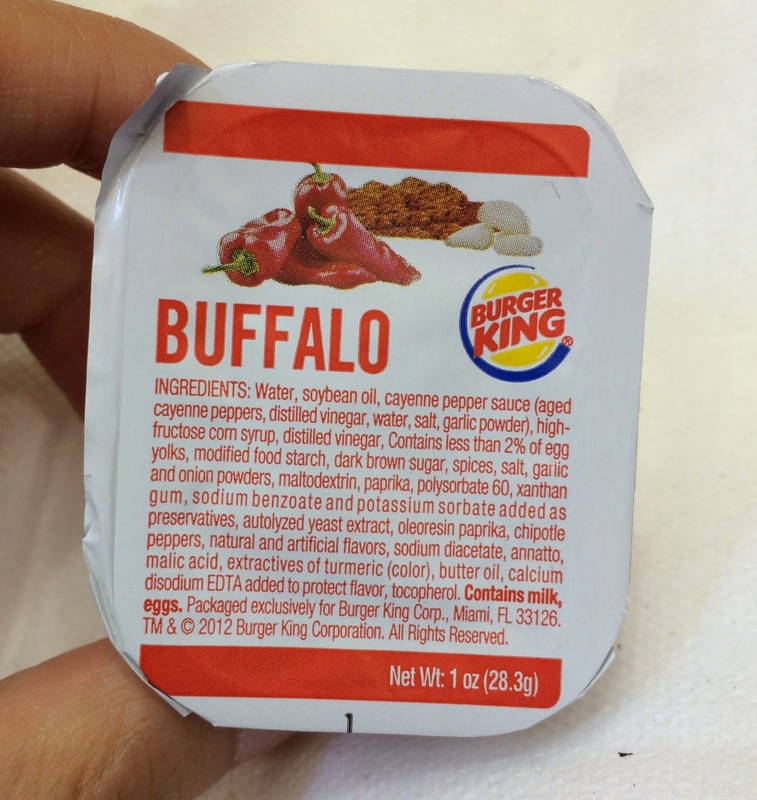 She started mumbling the name of the sauce so that I could only hear BBQ, Ranch and Buffalo, so I asked for Buffalo. A guy who handed me a bag was nice so I guess just the female cashier wasn't. "Be Your Way" was new to me as I'm used to see "Have It Your Way." 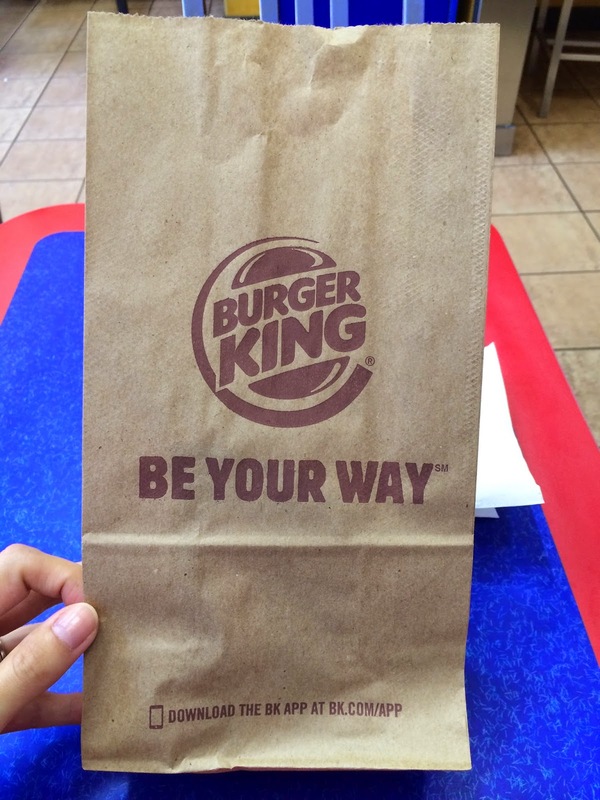 I guess they changed the slogan after or around they had "Burger King Proud Whopper" in San Francisco in June, 2014. 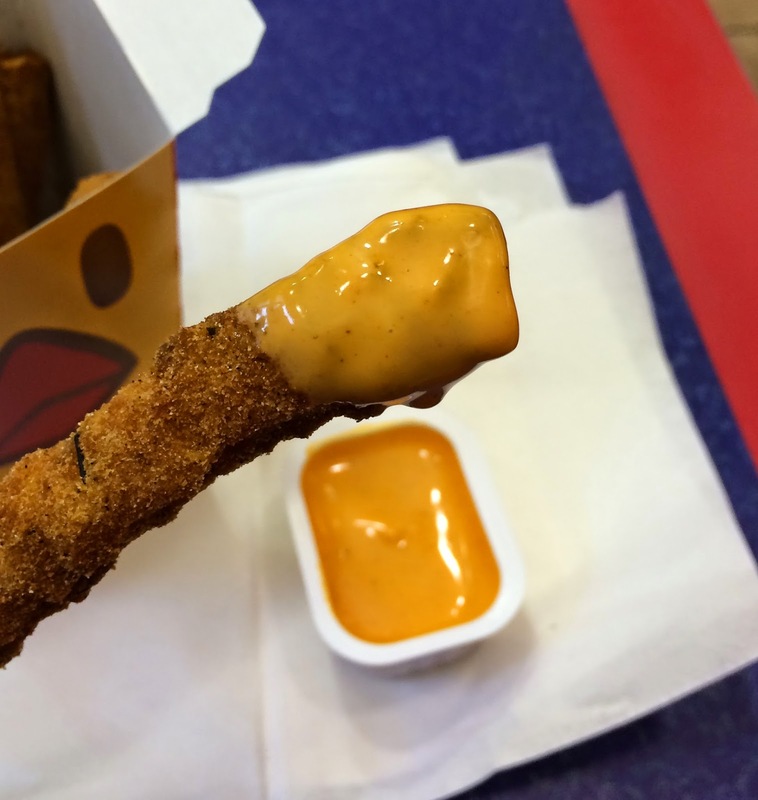 This is the Chicken Fries with Buffalo sauce. On the front, it's yellow bird with red beak. 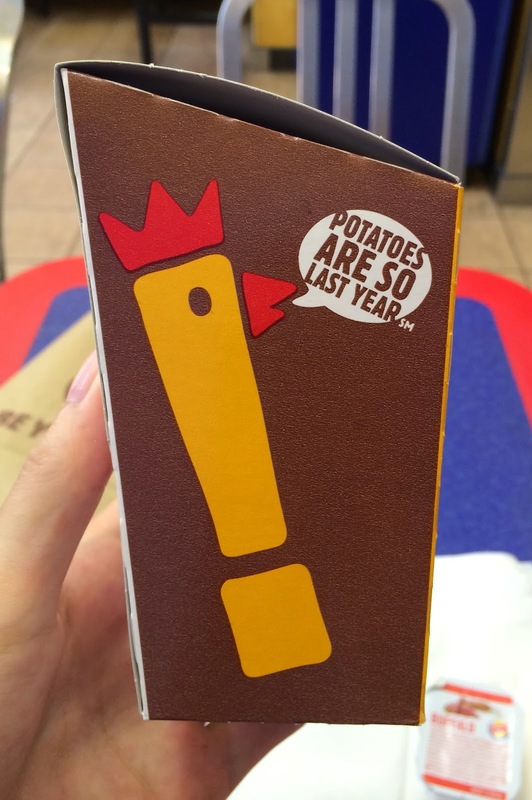 "Potatoes are so last year" with chicken-expanation mark says. 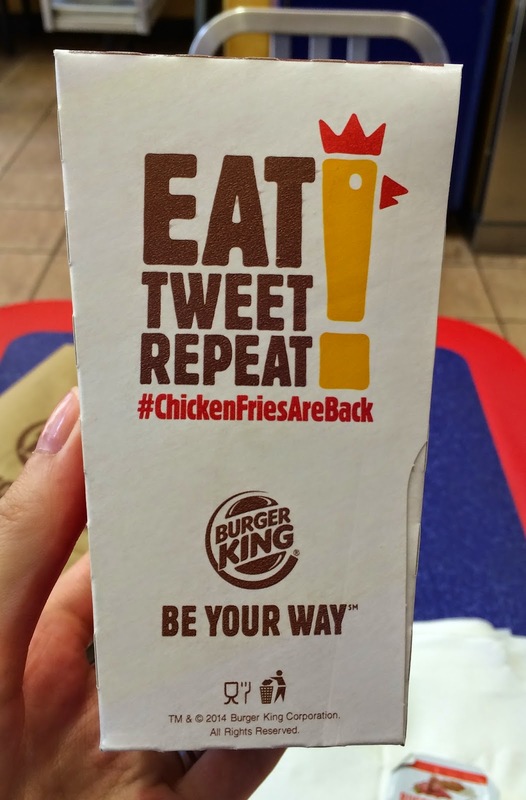 On the back, "Eat Tweet Repeat" with the long hashtag. 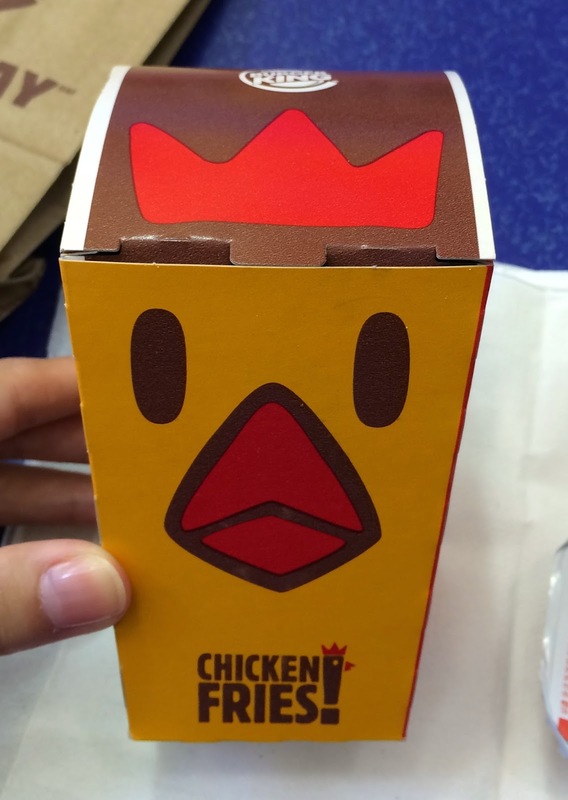 On the lid, there's a red crown. There're 9 stripes in the box. 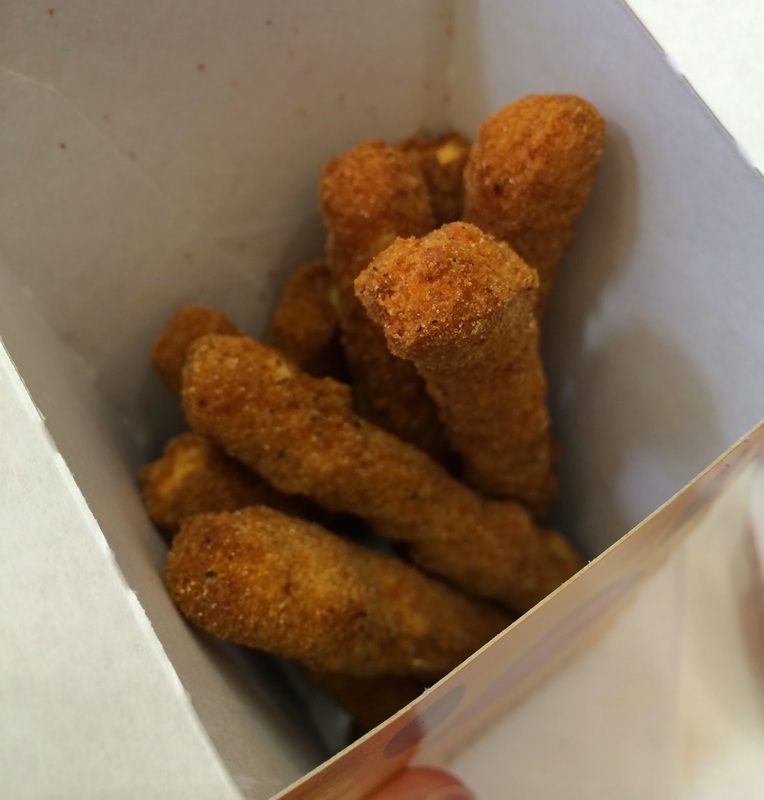 Each piece was lightly breaded with spices and herbs. 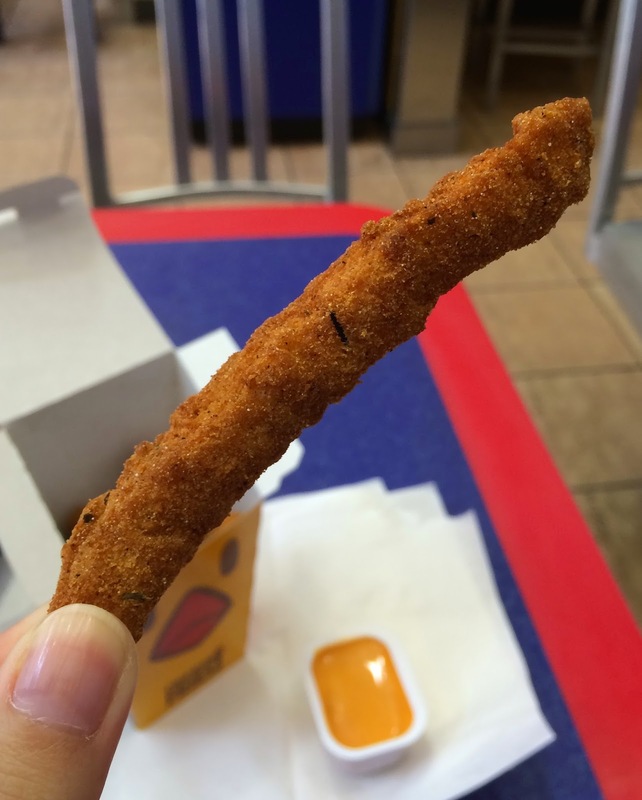 It's thin stick of white meat. 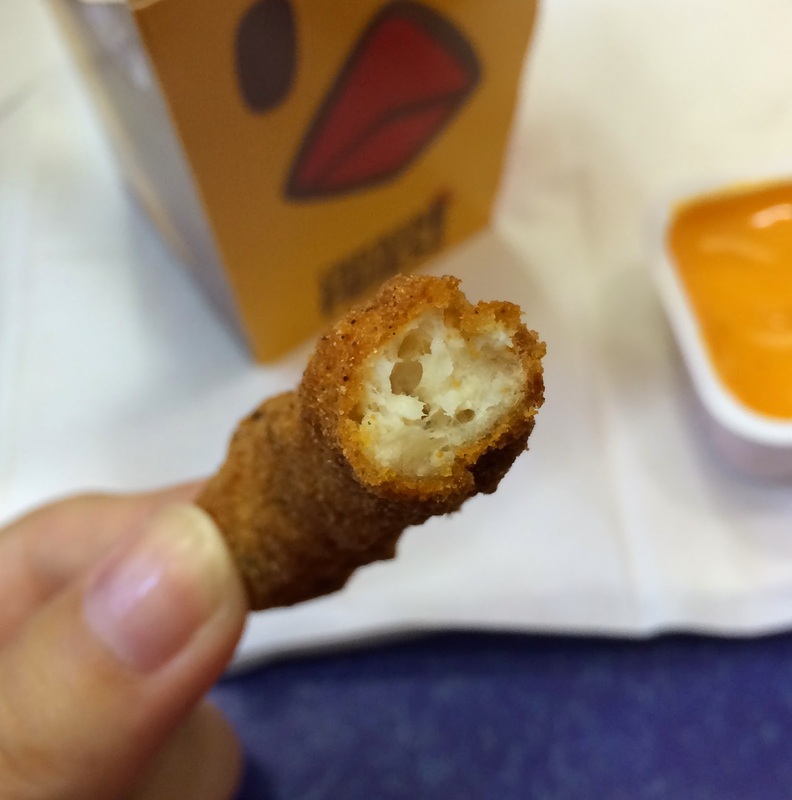 Buffalo sauce didn't taste like mayo but it's very creamy and had some spiciness. It's very crispy and I liked the breading; really fine spiced and herbed breading. 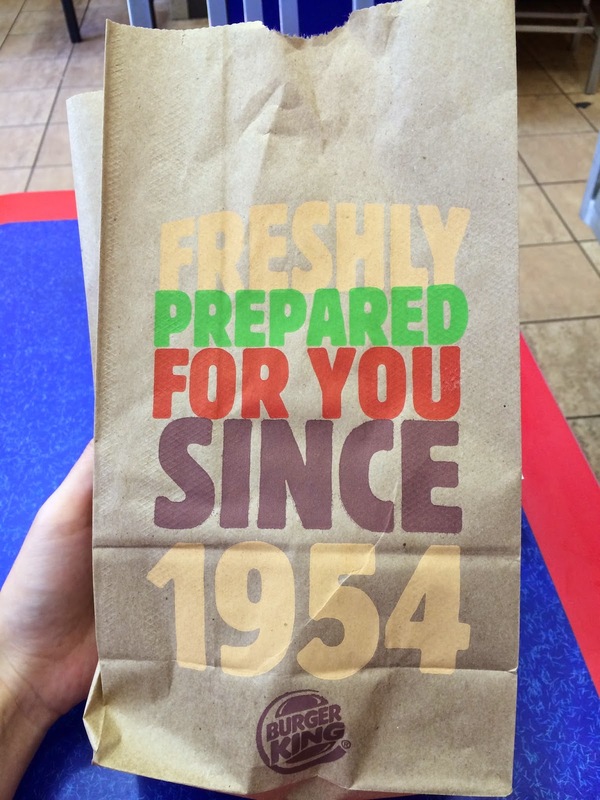 And the chicken inside was juicy. Next time I'd try it with other sauce. * Limited time only at participating restaurants.